Pictures of turkeys and Pilgrims have been trickling into my house for the past couple of weeks, courtesy of Mrs. R.’s kindergarten class. Yes, it’s November, and across the United States, people will be traveling to share a harvest feast with friends and relatives. If your education was like mine (that is, you didn’t grow up in New England), your study of Massachusetts history was probably limited to three major events: the arrival of the Pilgrims and the first Thanksgiving, the Salem witch trials, and Revolutionary Boston of the tea party and Paul Revere. In 1614, John Smith—yes, the same John Smith who met Pocahontas in 1607 Virginia—became one of the first Englishmen to explore the region then-known as “northern Virginia.” He renamed the area “New England,” drew a detailed map of the coastline, and wrote a best-selling (by 17th century standards) work titled A Description of New England. Smith wanted to found his own colony in the area, but a series of mishaps prevented him from returning to America. I’ve written before about the trials and costly errors experienced by the early settlers in Jamestown, Virginia. When the group of religious separatists (now known to history as the Pilgrims) planned the creation of their own New World colony, they first turned to Smith for advice. Give the Pilgrim Fathers their due—they were smart enough to learn from others’ mistakes. The Pilgrims (who called themselves Saints, not Pilgrims) gave us more than a November holiday. They created a representative democracy with an elected governor (as opposed to the Virginia Colony, where governors were appointed—first by the company and later by the king). The Mayflower Compact of 1620 was their mutually agreed-upon promise to follow laws enacted for the good of the colony. The Pilgrims named their new home Plymouth Colony (sometimes also called New Plymouth or Plymouth Bay Colony). And this is where history takes one of those interesting twists. While the names of the other permanent colonies come down to us in the names of the original 13 states (for example, the Virginia Colony evolved into the present-day Virginia), the Plymouth Colony ceased to exist as of 1692. What happened? In the years shortly after the Pilgrims arrived, another group of religious dissenters sailed to America. 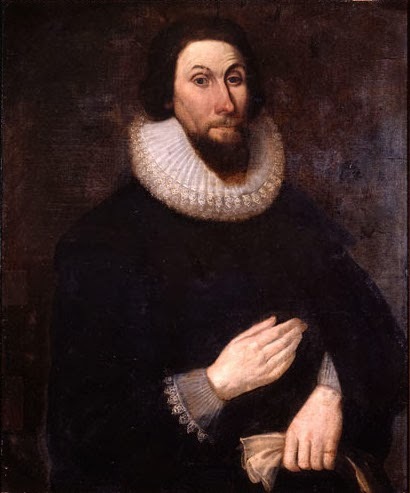 Led by John Winthrop in 1630, the Puritans settled the area just to the north of Plymouth and named their new home the Massachusetts Bay Colony. Theologically, the Pilgrims and Puritans shared many beliefs--both came out of the Calvinist tradition. Some time ago I wrote a post about how both groups used the Geneva Bible, an annotated version with a Calvinist slant (Geneva was ground zero for Calvinism in the late 16th century) much out of favor with the king and aristocracy because of its footnotes denying the divine right of kings. However, while Pilgrims wanted complete separation from the official Church of England, Puritans wanted to change it (purify it) from within. For the next decade or so, Puritans immigrated to Massachusetts in numbers that quickly dwarfed nearby Plymouth. While Plymouth had perhaps a few hundred settlers by 1630, Massachusetts welcomed almost 20,000 people during the decade of 1630-1640. However, with the elevation of Puritan Oliver Cromwell to “Lord Protector” of England, the inflow slowed to a trickle. By the time of Cromwell’s death and the restoration of the monarchy, the fervor of Puritanism had waned. Immigration into both Plymouth and Massachusetts all but ceased until after the Revolution. In 1692 (yes, the same year as the Salem witch trials) the two colonies merged into one colony called the Province of Massachusetts Bay. One final bit of trivia to consider over the weekend, particularly as more and more retailers encroach on the Thanksgiving holiday to promote Christmas profits, er, shopping. Neither the Pilgrims or Puritans approved of Christmas celebrations. This is an excellent short but concise history lesson. Funny to think about how many Americans are descended from those Puritans. Ahem, yes, apparently some changes there! Thanks C.J.! have a lovely Thanksgiving with your family (and that particularly busy little one). Yes, I thought about putting in there that literally millions of Americans are descended from the Puritans (I married one of them, in fact). You know, they seem to have done about as well at implementing God's kingdom on earth as the ancient Israelites did. My oldest is driving home this afternoon. Youngest is so excited. For the past 2 weeks, he's been saying, "Calvin tomorrow?" Finally, yesterday I could tell him, "Calvin is coming tomorrow." Dh is working Friday, so we'll be home with just the 5 of us. 5. This year it's 5. Much to be thankful for, even if we won't be breaking out the heirloom china for the meal. Hi, DebH. I had the same thought about Christmas, but I think I'd kind of like to go with the tradition of some other countries where Christmas is strictly a religious celebration and gift giving happens on different day (i.e., in the Netherlands, December 6 -- St. Nicholas Day). Interestingly, in my research, I discovered that Dutch Calvinists didn't have the same issue with Christmas as the English Calvinists. Cool, CJ. Thank you for sharing this. I love history and reading about it. This one is close to my heart. My ancestors - a great great (x many) grandfather and his two brothers, Hugeunauts (I know I totally mangled that) came from England and settled in Massachusetts in 1633. So I love reading about the history of the area. I like this post, CJ. I read it earlier and then went to check our family tree to see when Nelson's ancestor, Abraham Cruttenden arrived in America and if he was a Puritan or Pilgrim. Except I got so carried away with the family tree, I just found my way back here now. The following is from the "Genealogies of Connecticut Families", Vol. 1., p. 502: "Abraham Cruttenden was one of the first settlers of Guilford and was one of the 25 signers of the Plantation Covenant in 1639." "The colonists led by Rev. Henry Whitfield left England on 26th April 1639 in the 350 ton ship "St John" arriving at today's New Haven, Connecticut on 10th July 1639. Visit the Henry Whitfield Museum, Guilford, Connecticut. This home was built for Rev. Henry Whitfield who led a group of Colonists in founding Guilford, Connecticut, in 1639. It also served as the town meeting-house. It is the oldest known stone house still standing in what was once Colonial America. See the small chest inscribed "AC", it may have been Abraham's." And although Rev. Henry Whitfield was ordained in the Church of England, he was a Puritan who led his flock on the St John across the ocean and with whom Abraham Cruttenden and others made the covenant in 1639. Suzie, if you had one ancestor in Mass in 1633, you probably have dozens that arrived by 1640. Because immigration pretty much came to a stop after 1640, they married each other for the next 150 years. My dh was in Mass years ago and met a distant relative who had done genealogy of the family. Dh is descended from one of those early settlers 4 different ways. Lots of 2nd and 3rd cousin marriages by the 1700's because there was no one else there.